. : Sponsorship Opportunities for the Niagara County Bicentennial Celebration! :. 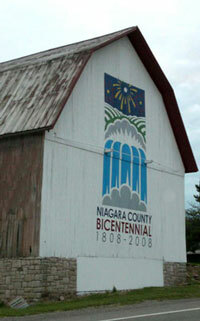 As part of the Niagara County Bicentennial Celebration, the Steering committee decided to have the Bicentennial Logo painted on barns throughout the county. Scott Hagan from Ohio is an expert in this area and has been contracted to do this work. Each of the county's 12 townships are representated at the following locations. Visit the barns with the "Larger Than Life" logos!